This post first appeared on Corwin Connect. Most often when we ask teachers about why they want their students to learn certain topics, we hear teachers say that they hope their students will lead productive lives in the future. They want students to be strong thinkers, problem solvers, readers, writers, and speakers. They want kids to see the world differently, and to be empowered to act differently, because of what they have learned. It seems that the goal of all learning––not just conceptual understanding––is transfer. The key to understanding transfer is this: Facts and topics do not transfer. By this we mean that facts and topics cannot be applied directly to a new situation. Whenever we try to apply our insights from one situation to another, we are always abstracting to the conceptual level, generalizing from a specific instance to a broader rule, before our knowledge helps us unlock the new situation. Our brains are wired for this process. A toddler, after tasting peas and broccoli, is hesitant to try spinach; he has created a relationship between taste and color to help guide his decisions when faced with a new vegetable. Another child predicts that the princess will be rescued from the clutches of the evil queen after watching several Disney movies where “good triumphs over evil.” We move naturally between factual instances and the conceptual rules or patterns that make up the logic of our world. The problem is, if we remain at the factual level, students stop trying to derive general ideas about what they’re learning. By the time they reach upper elementary school, they have been conditioned to retrieve knowledge on cue without deep understanding. Once they’ve learned to perform calculations involving fractions, we expect them to solve a word problem that asks them to cut a recipe in half or to double it. We’re surprised when learning doesn’t transfer in these ways. Too often, we assign students a poor grade and move on. The great thing about conceptual learning is that it makes visible and concrete the process by which we turn our knowledge of facts into transferable, conceptual understandings. When young math students use their study of fractions to investigate the relationship between multiplication and division, rather than just memorizing the algorithms, they are more capable of attacking a tough word problem where the appropriate algorithm is not obvious. These are examples of academic transfer, meaning the transfer of understanding from one school assignment to the next. When we talk about transfer of learning, we are also talking about transfer to real-world situations or problems. This means that students’ understanding of conceptual relationships should alter how they see the world beyond the walls of the classroom and how they solve problems that occur outside the neat, teacher-constructed parameters of an academic exercise. Notice that conceptual transfer is different from making connections. Teachers often ask students to make topical or factual connections to extend learning and make it meaningful. For instance, when the class is studying the impact of germs on the body, a health teacher may ask students to read articles about the problem of lack of proper hand washing in the spread of infection and decide whether or not they would support a law that required all children to wash their hands before eating snack or lunch. Clearly, students must draw on what they know to respond to this assignment. But they are not asked to draw on concepts; rather, they are asked to rely on facts about the topic of germs. Conceptual transfer only occurs when students apply insights about the relationship among concepts to a new scenario. 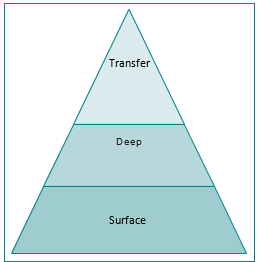 He says there are three distinct levels of learning: surface, deep, and transfer (Figure 1)—and all three levels are essential. Hattie and his coauthors stated, “Together, surface and deep understanding lead to the student developing conceptual understanding.” They agree that, “the ultimate goal, and one that is hard to realize, is transfer. When students reach this level, learning has been accomplished” (Fisher, Frey, & Hattie, 2016, p. 19). When we recognize exactly how to move from surface, then on to deep, and finally to transfer levels of learning, education becomes more meaningful for students. They become thinkers, problem-solvers and innovators as they use their learning in new and unfamiliar contexts. More information on this topic watch our free webinar. This post is excerpted from: Tools for Teaching Conceptual Understanding, Elementary and Tools for Teaching Conceptual Understanding, Secondary.